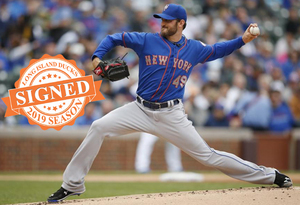 (Central Islip, N.Y., April 10, 2019) – The Long Island Ducks today announced the signing of left-handed pitcher Jon Niese. The nine-year Major League veteran begins his first season with the Ducks and 13th in professional baseball. Niese spent time during all nine of his MLB seasons with the New York Mets (2008-16) while also pitching with the Pittsburgh Pirates in 2016. He made 211 appearances (197 starts) in the big leagues, compiling a 69-68 record with a 4.07 ERA, three complete games, two shutouts and 914 strikeouts over 1,189.1 innings of work. The Ohio native recorded his first Major League win in his second career start when he tossed eight scoreless innings and struck out seven batters in a 5-0 win over the Atlanta Braves at Shea Stadium. Niese also made six postseason appearances during the 2015 season, helping lead the Mets to their fifth National League championship in franchise history. The 32-year-old was previously named to the Baseball America Major League All-Rookie Team in 2010 after making 30 starts with the Mets, going 9-10 with a 4.20 ERA, two complete games and 148 strikeouts over 173.2 innings. He earned South Atlantic League Mid-Season All-Star honors in 2006 with Single-A Hagerstown and went 11-9 with a 3.93 ERA in 25 starts that season. The southpaw most recently participated in spring training with the Texas Rangers in 2018 and New York Yankees in 2017. He joins Long Island after being selected in the player draft following the Atlantic League’s Player Showcase March 29-31 in Lakeland, Fla. Niese was originally selected by the Mets in the seventh round of the 2005 amateur draft.